Kentucky: Forget what the Wildcats might do for now, instead let’s focus on what they have done. UK is the No. 1 defensive team and No. 9 offensive team by the DIFFs algorithm. They have five wins against the KPI Top 50 by an average margin of 17.2 PPG. Big 12 Non-Conference Schedule Almost Complete: The Big 12 is 104-22 (.825) in non-conference play with one non-conference game yet to play (Baylor will play a Non D-I in a few weeks). The Big 12 is No. 1 in the KPI Conference Rankings (followed by the Big East, ACC, Big Ten, and SEC). The Big 12 and Big East will both play a true double round robin conference schedule. Old Dominion: Old Dominion has climbed to No. 10 in the current KPI Rankings. A home win over No. 7 VCU (+.75) and Paradise Jam quarterfinal victory over No. 31 LSU have held strong. ODU’s strength of schedule sits at No. 96, with a remaining SOS of 215. Conference USA is the No. 14 conference through Sunday, but only UTEP (No. 64) and Charlotte (No. 72) are in the Top 100. ODU gets Charlotte twice this season (the first meeting came Sunday) and plays UTEP only once (at UTEP, Feb. 14). SWAC Home Games: In non-conference play, the SWAC played 85.1% of their games away from campus, finishing with 103 road/neutral games and 18 home games. Only the MEAC (who has three additional members) played more. Feasting on Non-Division I Teams: Division I teams are a combined 393-6 (.985) against Non-Division I competition. The averaging margin of victory is 29.2 points per game (85.8-56.5). In 2013-14, Division I teams went 425-14 (.968) vs. 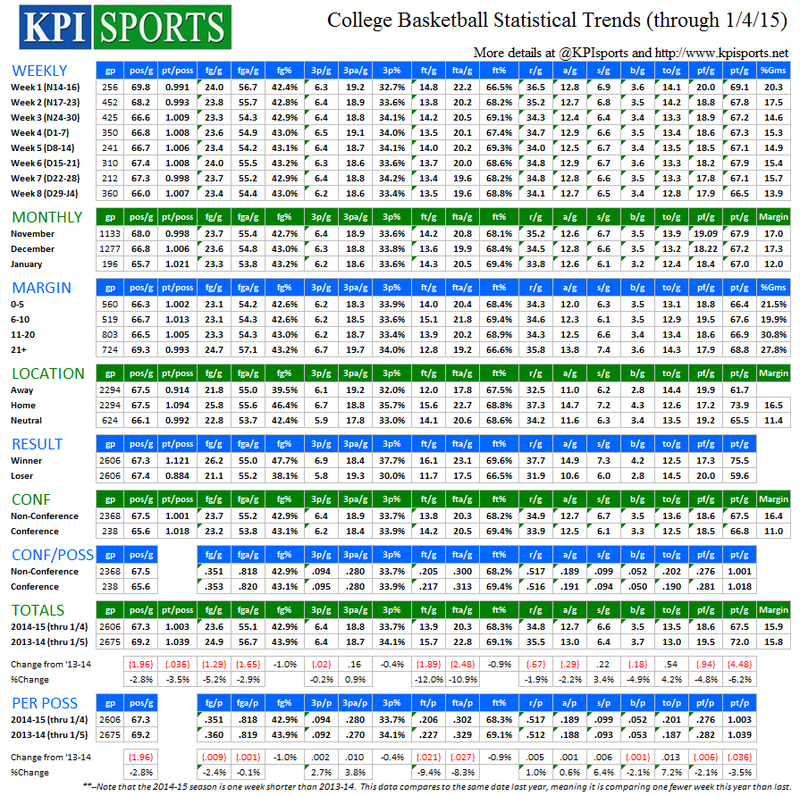 Non D-I schools by an average margin of 29.7 PPG (90.2-60.5). Tighter Games in Conference: The average margin per game is 16.4 PPG in non-conference games this year, but only 11.0 PPG in conference games. Scoring (as is customary) is slightly lower in conference play (66.8 PPG) than non-conference (67.5 PPG). Best Defensive Teams: By the KPI DIFFs algorithm, the best defensive teams in the country are (1) Kentucky, (2) Louisville, (3) Virginia, (4) San Diego State, and (5) Oklahoma. Season Scoring Trends: The downward trend in scoring has continued. 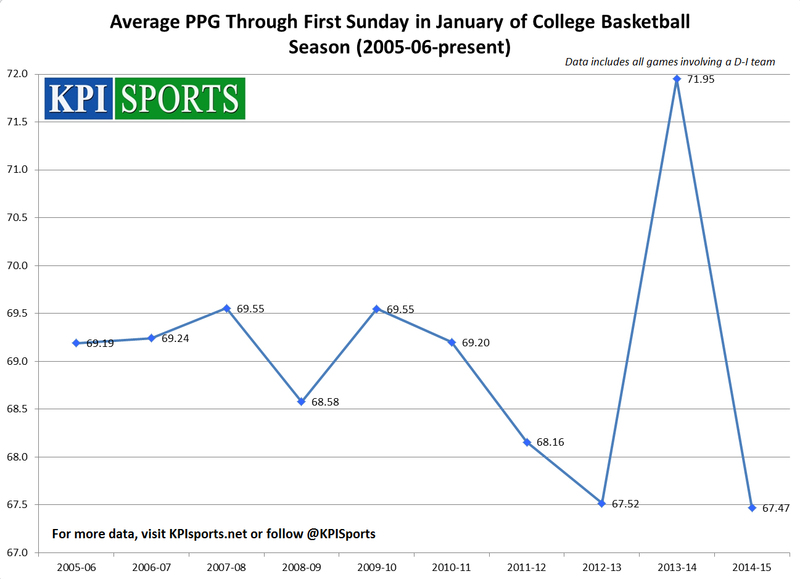 Scoring is down 6.2% (4.48 PPG) between this year and data through the first Sunday in January last year. Pace is down (1.96 possessions per team, per game). Free throw attempts are down 10.9% (2.48 FTA/game). Steals and turnovers are both up on a per game basis and also a per possession basis. Teams are also shooting more 3’s per possession (up 3.8%).